The Fund has limited operating history upon which investors can evaluate its potential performance. Investors should take this into consideration and carefully assess all factors such as risks, investment objectives and fees in conjunction with performance history before investing in the Fund. Investment returns and principal value will fluctuate, so that investors’ shares, when sold, may be worth more or less than their original cost. Current performance may be lower or higher than the performance data cited. Investment Objective: The Fund seeks to generate attractive long-term investment returns relative to traditional equity indices employing a global long/short equity strategy. 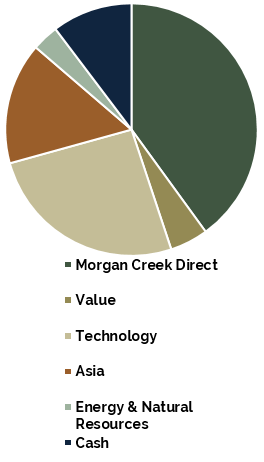 Manager Selection: Morgan Creek leverages its extensive network of relationships to assemble a portfolio that consists of top-tier investment managers. Portfolio Construction: The Fund seeks to invest across multiple geographies, sectors, and strategies within the long/short equity asset class. Diversified Portfolio: The Fund is diversified across multiple investment managers who vary by geography, sector, strategy, with no underlying manager comprising more than 10% of assets. 1 Performance is shown as of month-end for a new eligible investor, since inception, net of all fees and expenses. 2 Benchmarked to MSCI World (Net). 3 Data as of 03/31/19 and is a percentage of gross assets. PAST PERFORMANCE IS NO GUARANTEE OF FUTURE RESULTS. Performance is shown as of month end for a new eligible investor, since inception, and is net of expenses. The Prospectus contains important information regarding the investment objective, risks, fees and charges related to the fund. Please read the prospectus carefully and consider these factors prior to investing. 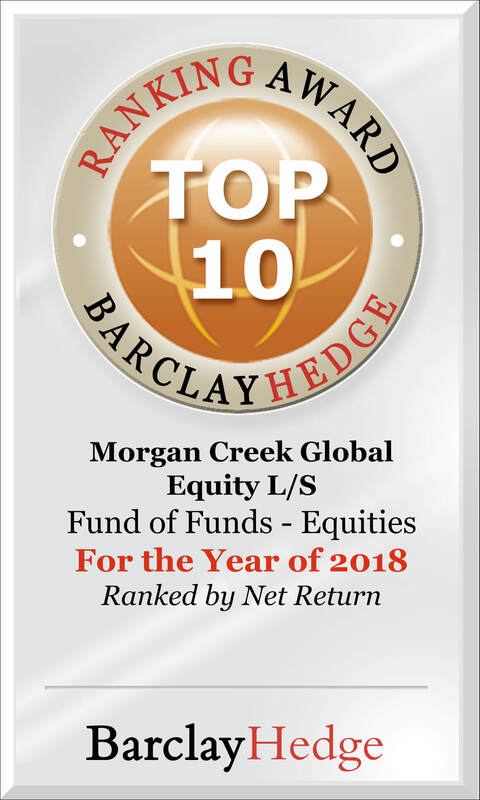 A prospectus may be obtained by calling (919) 442-6311 or visiting (www.www.morgancreekfunds.com).The election to redeem shares is made by the Board of the Feeder Fund in its sole discretion. The Advisor currently expects that it will generally recommend to the Board that the Feeder Fund offer to repurchase Shares from Shareholders quarterly on March 31, June 30, September 30 and December 31. The Fund generally on a quarterly basis expects to offer to repurchase shares from its shareholders in accordance with written tenders by shareholders at those times, in those amounts, and on such terms and conditions as its Board of the Fund may determine in its sole discretion. This is neither an offer to sell nor a solicitation of an offer to buy interests in any investment fund managed by Morgan Creek Capital Management, LLC or its affiliates. Any such offering can be made only at the time a qualified offeree receives a prospectus and other operative documents which contain significant details with respect to risks and should be carefully read. Neither the Securities and Exchange Commission nor any State securities administrator has passed on or endorsed the merits of any such offerings of these securities, nor is it intended that they will. Registration with the SEC does not mean or imply any SEC approval of the Fund as to investment quality or suitability This document is for informational purposes only and should not be distributed. There can be no assurance that the investment objectives of any fund managed by Morgan Creek Capital Management, LLC will be achieved. 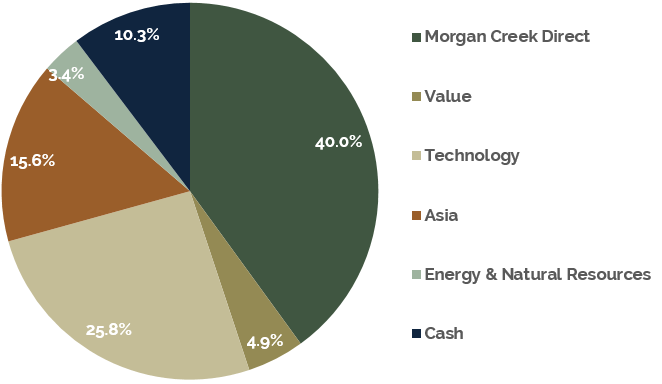 Morgan Creek Capital Management, LLC does not warrant the accuracy, adequacy, completeness, timeliness or availability of any information provided by non-Morgan Creek sources. Securities distributed through Morgan Creek Capital Distributors, LLC, Member FINRA/SIPC. An investor should consider investment objectives, risks, charges and expenses of the Fund(s) carefully before investing. Please read the prospectus for complete information before investing. Securities distributed through Morgan Creek Capital Distributors, LLC, Member FINRA/SIPC. Copyright © 2011 Morgan Creek Capital Management, LLC MORGAN CREEK is a registered service mark of Morgan Creek Capital Management, LLC. Morgan Creek Capital Management is also registered as a trade mark in the United Kingdom (registration number UK00003088978). All trademarks, service marks, and logos appearing on this Site are the exclusive property of their respective owners. The information on this Website is not an offer to sell or solicitation of an offer to buy an interest in any investment fund or for the provision of any investment management or advisory services. Morgan Creek Capital Management, LLC and its affiliates do not offer legal, accounting or tax advice.